This also prints the 'Reply' link, but I'd like to remove that one. How can I do that? Note: I'm able to hide the 'Reply' link with CSS, but that's not a very nice solution. I think you should be able to change this behavior by modifying the comment settings for each content-type. This could be done by going into admin/structure/types/manage/<your-content-type>, scroll down and click on comment settings in the left menu. 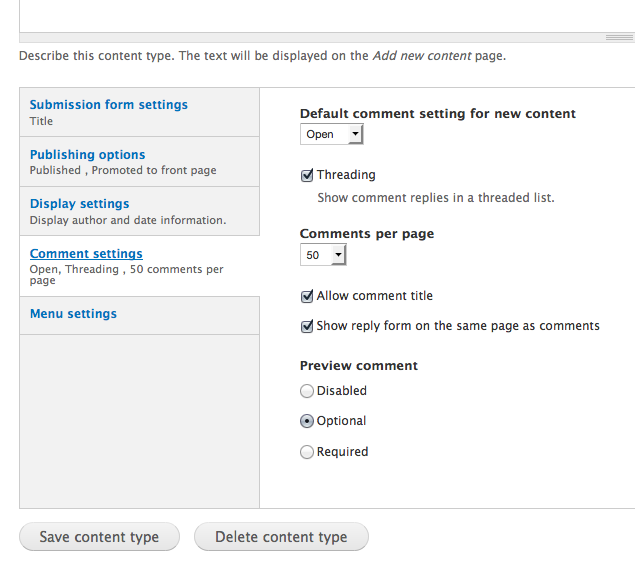 In the settings form you then uncheck the box next to Show reply form on the same page as comments. Not the answer you're looking for? Browse other questions tagged 7 theming comments or ask your own question. How do I remove taxonomy links from nodes?